The global populist fever is catching. Put the nation first before all else, patria before sense. Make America Great Again. One Nation before any other. Australia has been a fairly non-responsive patient to that effect, keeping its symptoms to the rural fringes of the country, or the more bitter blue-collar edges disgruntled by immigrants. While essentially conservative and reactionary, the Australian skill over the years has been to temper revolt with urbanism, mortgages and status anxiety. But the emergence in recent months of the Trump presidency has stirred a virus of sorts, moving through the political body at some speed. Homes are becoming unfordable. Australia’s banks, a long protected profit-making racket, continue charging monstrous fees for using the money of citizens. (Their wealth is your benefit.) Industries are closing or, in the weight loss metaphor, down-sizing. Governments and the main opposition party are getting edgy. Much of this has been fanned by Pauline Hanson’s One Nation Party, an entity conservatives were so keen on destroying during the 1990s they established a special fund to do so, run by the deposed former Australian Prime Minister, Tony Abbott. He was to have the monopoly on reactionary politics. A campaign of such fanatical fury ensued against Hanson, one with shades of hollow martyrdom, genuine persecution, and political vengeance. It came from political and cultural circles, from faux Australian elitism and snobbery, and those fearing she was having a bite of their electoral cake. Tribal mania kicked in, and she had to be destroyed. Convict culture, rather than being egalitarian, hoards, protects, preserves. Hanson, it was suggested, was out to get more than her fair share. For a time, she even became the subject of cruel, albeit apt satire for a drag queen by the name of Pauline Pantsdown, nabbing her statement “I don’t like it” and immortalising it, if only across a narrow spectrum. Australia, having never had clear cut, totalitarian types who scream eloquently and supply erudite arguments for ostracising or killing races, could only point at Hanson. She was comedy, she was easy, and she had red hair. No poorer example was possible. After her parliamentary loss and subsequent brief imprisonment for corruption, Hanson was confined to the reality television circuit, a shadow of Trump cast, doing the rounds as a minor celebrity on trash celluloid. Even there, there was some sympathy. The goblin of populism lay, gazing and stirring. She was bound to ride again. Then came the elections in 2016, an event which almost unseated the Turnbull government. This was a good test case in cutting down smug, establishment confidence: the lawyer, banker Prime Minister, happy to gamble on his reading of the Australian electorate’s temperature, fell terribly and broke his party. It resulted in an overdose for the conservative coalition, and the spread of concern that has seen various members of the government speak of defection and sabotage. The foolish calculation of gaining an advantage over his Labour opponents and cross benchers almost cost him government. But one of the greatest beneficiaries was a stormily renascent One Nation, now a heckling presence in the Senate. Not only did Hanson return with her coarseness slightly polished – she brought senators in tow. Canberra had to finally wake up. 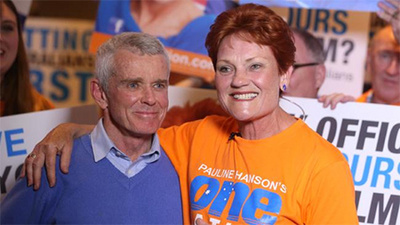 At the state level, the One Nation threat is sending State premiers giddy with fear. The sharp cliff face looks promising. Electoral defeat, like a potential loss of life, creates monstrous romances and disturbing flings of speculation. Anything to survive. Long assumed positions on voting strategy are being abandoned. Conspiracies are being hatched. The Western Australian state leader, Colin Barnett, succumbed to what had been deemed a wicked temptation: yielding to a vote-sharing deal with One Nation at state elections due next month. Not all were impressed by the arrangement, with Liberals (that is to say, Australian conservatives) more inclined to the political centre concerned that a suicide pact had been made. Never, went the line, would they make a preference vote deal with Hanson’s outfit. Their National Party partners were also fearful that their traditional voters would make an electoral dash, draining their traditional base. Such are the times. Traditional party establishments who refuse to adapt are perishing before an electoral anger that is singeing the base and torching bridges. Hanson can praise Russia’s Vladimir Putin as “a strong leader”. Voters, be they the sanctified forgotten, the product of amnesiac intelligentsias and spread-sheets of political predictions, are moving their feet to the beat of a dark music. Not just dark, but angry.